Welcome to a revolutionary new mindset. in the conventional diet and exercise industry. diet mentality and begin to trust yourself again. and less struggle surrounding your food. YOU to gain the skills needed to free yourself from the diet mentality and begin to trust yourself again. Breathe and Eat© is NOT a diet program. Believe it or not, your body is hardwired for health. This program will provide the structure and foundation necessary to let go of the chaos and drama created by the mind. You will begin to listen authentically to the sensations from your body so you can move forward in your journey with more grace and ease. With Rochelle Rice as your guide, you will be able to make choices with LESS DRAMA, LESS ANXIETY, LESS WORRY about cravings. It is time to BREATHE & EAT, experiencing your body and all its innate wisdom. For the first time, Breathe & Eat © is being offered outside the classroom. Rochelle Rice has been working with clients individually and in small groups for years. This program is the product of that teaching and personal practice. Rochelle understands plus size women and knows how to motivate us. I have had an often tumultuous relationship with my body and with food. This program is unique and powerful and promotes a healing relationship within yourself. This is a truly simple, doable program that will definitely surprise with new insights about yourself, and how much better you'll feel after a meal. 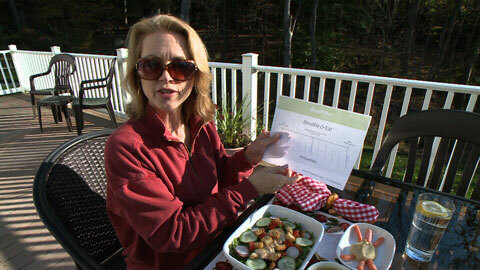 Purchase Rochelle Rice's Breathe & Eat© program now to step off the roller coaster and feel grounded in your health. It's Time to Step Off the Diet Rollercoaster and Breathe into Health! Rochelle is incredibly passionate about teaching women how to connect with their bodies through safe, achievable movement! Sign up here to receive these COMPLIMENTARY health guides from her to help you get started on a path of wellness today! Feel More Vibrant in 24 Hours! Energize Your Entire System in 3 Minutes! Boost Your Metabolism with Breathing Exercises! Breathe and Eat is NOT a diet program. Believe it or not, your body is hardwired for health. This program will provide the structure and foundation necessary to let go of the chaos and drama created by the mind. With it, you will begin to listen authentically to the sensations from your body so you can move forward in your journey with more grace and ease. Rochelle Rice, MA, is the President of In Fitness & In Health, the creator of the Plus-Size Exercise Technique, the author of "Real Fitness for Real Women" and the creator of the Breathe & Eat program. Affiliate Members of the Breathe & Eat program can earn 20% of the sale for each member that signs up!